State seal of North Carolina by NC Department Of Transportation; public domain image on Wikipedia. 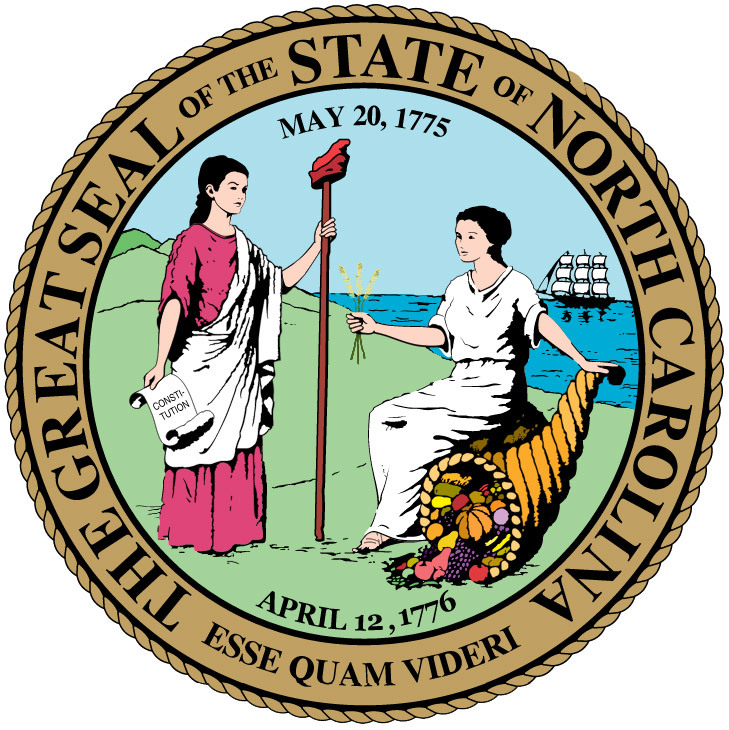 The state seal of North Carolina has had many changes since its origin in 1663. During colonial times North Carolina used four different seals successively. Since the war for independence, six different seals have been used. Liberty, the first figure, standing, her pole with cap on it in her left hand and a scroll with the word "Constitution" inscribed thereon in her right hand. Plenty, the second figure, sitting down, her right arm half extended toward Liberty, three heads of grain in her right hand, and in her left, the small end of her horn, the mouth of which is resting at her feet, and the contents of the horn rolling out. The background on the seal shall contain a depiction of mountains running from left to right to the middle of the seal. A side view of a three-masted ship shall be located on the ocean and to the right of Plenty. The date "May 20, 1775" shall appear within the seal and across the top of the seal and the works "esse quam videri" shall appear at the bottom around the perimeter. No other words, figures or other embellishments shall appear on the seal." Legislation added the date "April 12, 1776" in 1983 (the date of the Halifax Resolves; this date also appears on the state flag of North Carolina) to serve as a constant reminder of North Carolina's commitment to liberty.
" ... a document that places the Old North State in the very front rank, both in point of time and in spirit, among those that demanded unconditional freedom and absolute independence from any foreign power. This document stands out as one of the great landmarks in the annals of North Carolina history" (quote from North Carolina State Library: The State Flag).